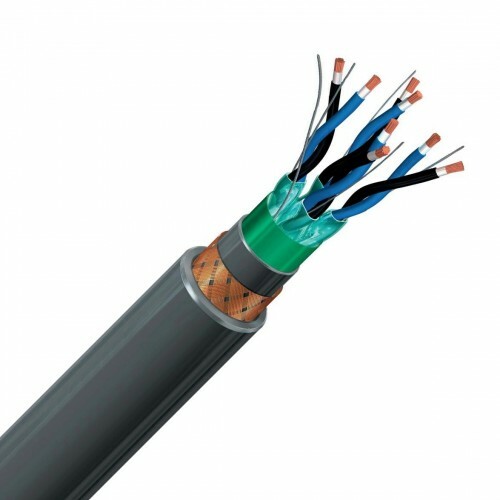 Fire-resistant armored, individually and collectively screened multi-pair or triad cables for installation in essential circuits in marine and offshore applications with special performance on flame spread, fire resistance and low emission of smoke and acid gas. Enhanced mechanical, cold, weather, and oil resistance properties. 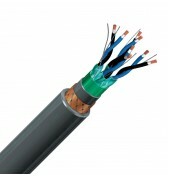 Soft annealed stranded Class 5 copper according to IEC 60228, Mica tape fire barrier, Halogen free cross-linked polyethylene (HF XLPE) insulation according to IEC 60092-351, Individual Aluminum/polyester tape with tinned copper drain wire and non metallic electrical isolation tape, Collective Aluminum/polyester tape with tinned copper drain wire and non metallic electrical isolation tape, Halogen free thermoplastic polyolefin (SHF 1+) bedding, Bronze wire braid armour, Halogen free thermoplastic polyolefin (SHF 1+) outer sheath IEC 60092-359.